The UV-curable ink is cured and adhered to the media or substrate by UV radiation. The print is already dried when it comes out of the printer, allowing a short delivery request to be met. Printing on non-absorbent materials, including plastic, glass, and metal, is available. To give shape to ideas, Mimaki offers a range of UV-curable ink products to meet demands from various industries, ranging from decorating and architecture to industrial design. UV curable ink [LH-100], [LU-125], [LUS-120], [LUS-150], [LUS-170], [LUS-175] and [LUS-200] gained the "GREENGUARD Gold" certification by UL LLC of third-party institution of safety science of the United States. The color components of the ink are directly cured and adhered to the media or substrate by UV radiation, and the ink emits very low levels of VOC (volatile organic carbon). The LED (light-emitting diode) light does not radiate short wavelengths that generate ozone. Use of Mimaki UV-curable ink demonstrates consciousness about the environment and the health of users. Mimaki first adopted the use of LED light to solve all the problems associated with metal halide lamps, such as long warm-up or restrike times, high power consumption, large bulbs, short lamp life, and high temperatures. 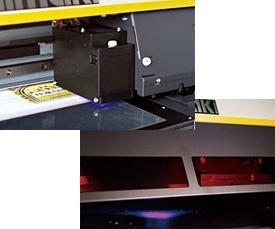 The LED–UV ink curing system not only provides high quality printing with speed but also meets various demands from users with high media compatibility. The power consumption and heat generation of LED lights are remarkably lower than those of metal halide lamps. In addition to energy and cost saving, the long-life LED light reduces lamp wastage because of replacements. Thanks to the low heat generation of LED–UV light, Mimaki UV ink is capable of printing vibrant and beautiful colors on heat-sensitive materials, such as acrylic board, PVC, PET, etc. High-speed printing at 60 m2/h with vibrant and fine print results is achieved. We have been developing inks and printers for years, and hence have been able to focus our technologies for obtaining the best results from both. Smooth and beautiful gradation printing is available due to the excellent color reproducibility of the inks as well as by the use of Mimaki’s inkjet technology. Hard and soft ink types are provided. Hard inks are used on the surfaces of hard materials, such as plates. Soft and flexible inks are suited for membrane panels, films, vehicle-wrapping films, and packaging films. Mimaki UV inks have high media compatibility for a wide range of applications. White ink is used as the base layer for color printing. The white base layer enhances color printing on transparent media. Because of the high light transmittance of the media, printed colors are not very vivid. The printed image is bright and vivid on the white ink base layer. Embossed printing is also available by combining the use of a primer with color inks. The UV ink broadens the range of possible print designs. UV curable ink [LH-100], [LU-125], [LUS-120], [LUS-150] , [LUS-170] , [LUS-175] and [LUS-200] gained the "GREENGUARD Gold" certification.